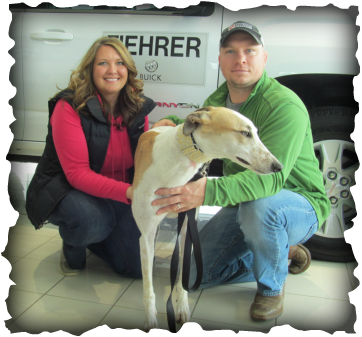 E's Aladdin was adopted on Valentine's Day at the Valentine Event held at Fiehrer Motors in Hamilton. Nicole and Josh have been part of the GAGC family for years and recently lost their two sweet hounds. Nicole is a vet and helped GAGC with vetting five of our new dogs, she of course fell in love with all of them, but especially with Aladdin. This boy has a new name, Giovani (GIO) and is starting the best years of his new life! We hope to see Nicole, Gio and Josh at lots of our future events.